Written by Afsheen Sharifzadeh, a graduate of Tufts University focusing on Iran and the Caucasus. This article surveys the Iranian presence in pre-Islamic Arabia and the medieval Islamic world, addresses Classical Arabic loans in Modern Persian and features an exclusive English-language listing of 200 Middle Iranian loans in Classical Arabic and their etymologies, compiled by the author. 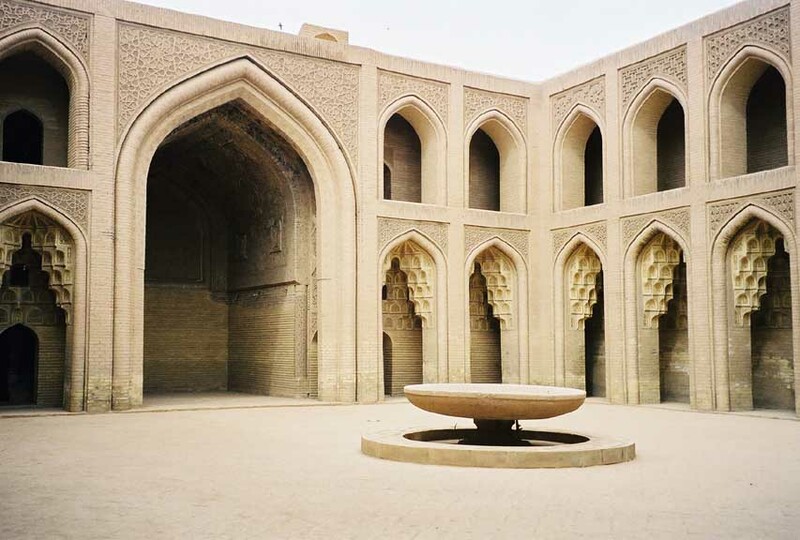 A library in present-day Baghdad, named after Bayt al-Hikma; courtyard view, Abbasid-era portion. Whereas pre-Islamic Iranian languages are all virtually free of Semitic vocabulary, Aramaic, Syriac, Hebrew, and Arabic have borrowed a remarkable number of words from Iranian (as did late Babylonian, Achaemenid Elamite, Armenian, Georgian, most Turkic languages, and later, Urdu). Historical linguists have afforded the majority of these languages exhaustive pedigrees of Iranian borrowings, but regrettably few authors have paid attention to the Iranian loans in the Arabic language and literature, and in doing so, have ignored a rich narrative of cultural contact and appropriation. The Sassanid Empire (224 A.D.-651 A.D.) was the last Zoroastrian Iranian polity before the arrival of Islam. 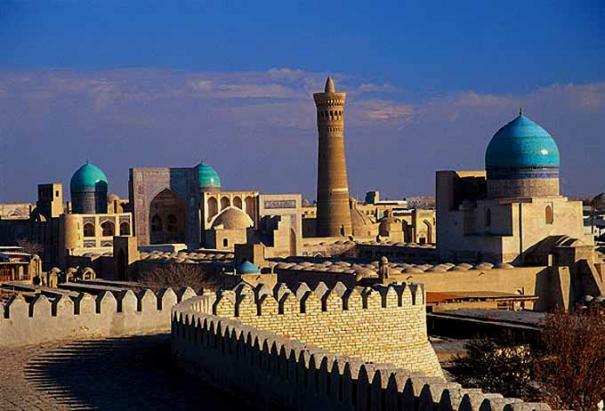 Sassanian and Byzantine antecedents formed the creative backbone of early Islamic material and visual culture. It is no mystery that following the conquest and Islamization of Sassanid Persia throughout the 7th and 8th centuries AD, Iranian languages were shot through, even to the most far-flung dialects, with Arabic loanwords. But never did Arabic attain a currency of a lingua franca in the Iranian world. Instead, knowledge of the Arabic language in Persia throughout the Islamic period was limited to educated city-dwelling Muslim circles, and it was from this stratum of society that Classical Arabic lexica were gradually and purposefully incorporated—often undergoing abstract semantic shifts—into “erudite speech”, which became the basis of New Persian literature, scholarship, and poetry. These Iranian religious figures, literateurs, linguists, poets, historians, mathematicians, chemists, alchemists, astronomers, physicians, geographers, musicians, and philosophers became preeminent contributors to the canonization of the Arabic language and its transformation from a regional nomadic tongue into a universal vehicle of both doctrinal and secular learning. 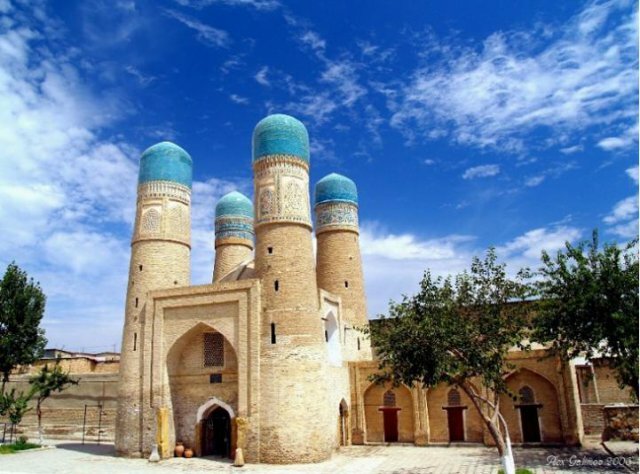 Acculturation was taking place along the same vector– whereby medieval Islamic architecture, horticulture, cuisine, attire, court culture, political offices, etc. were systematically appropriated from earlier Persian and Byzantine models. 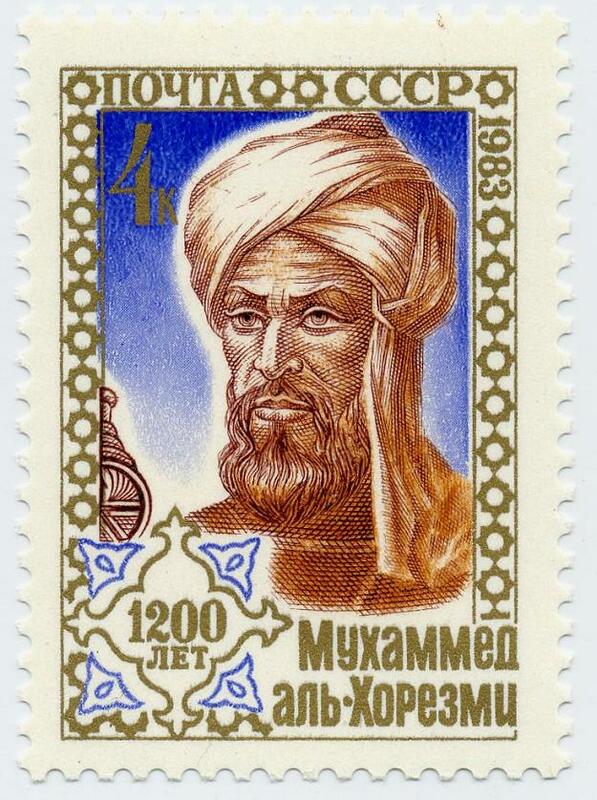 Al-Khwārizmi was a Persian mathematician, astronomer, and geographer during the Abbasid Caliphate. The English word “algorithm” is his namesake, and the word “algebra” derives from al-jabr, an operation he used to solve quadratic equations. Here he is pictured on a postal stamp issued by the USSR in 1983 (left) and immortalized in statue at Khiva, Uzbekistan (right). It follows that the first grammar of the Arabic language, al-Kitāb, was written by the Persian author Sībūyeh (Arabic: Sībawayh) in the 8th century AD, and many of his Iranian contemporaries with masterful command of Arabic, including Ibn al-Muqaffa’, translated thousands of Indian, Greek, Syriac, and Persian literary works from Middle Persian into Classical Arabic. The epicenter of these intellectual activities was Bayt al-Hikma (literally “House of Wisdom”) in Baghdad, which was the Abbasid Caliph al-Ma’mun’s appropriation of the Sassanid Persian Academy of Gundishāpur, the world’s first center of both religious and secular higher-learning. The Caliph had the contents of Gundishāpur and its world-renowned hospital transported to Bayt al-Hikma, which was staffed by graduates of the Academy of Gundishāpur and wherein the methods of the older Persian academy were to be emulated. The Bukhtishu-Gundishāpuri family were Nestorian Assyrian physicians from Persia who served at the Abbasid court through the 7th, 8th, and 9th centuries, spanning six generations. The Caliph al-Mansur’s new capital and crown jewel, Baghdad (“God-Given” in Persian), was no exception to this trend; the city had been modeled off of the quintessential Sassanid round city plan (such as at Firuzābād) by a Persian architect and planner, Mashallah ibn Athari, and the auspicious location had been determined by Nawbakht, a Zoroastrian priest. The Abbasid and Fatimid bourgeoisie were patrons of Persian garments, etiquette, court culture, and cuisine, and relied heavily on Persian viziers such as the Barmakid family to oversee crucial matters pertaining to finance and state administration. As such, they adopted the Sassanid postal system and bureaucratic system (diwān). 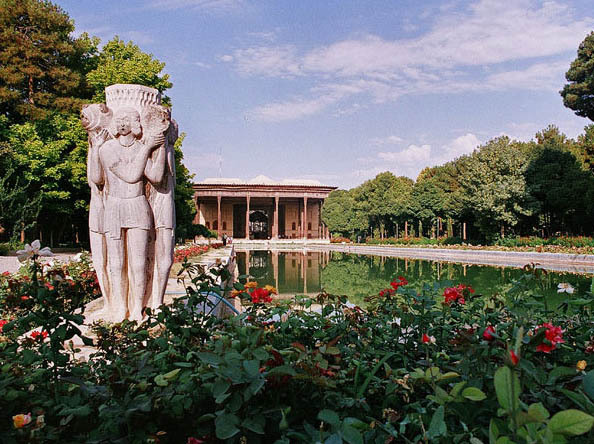 Persian gardens (top) have influenced the design of gardens from Andalusia to India and beyond. 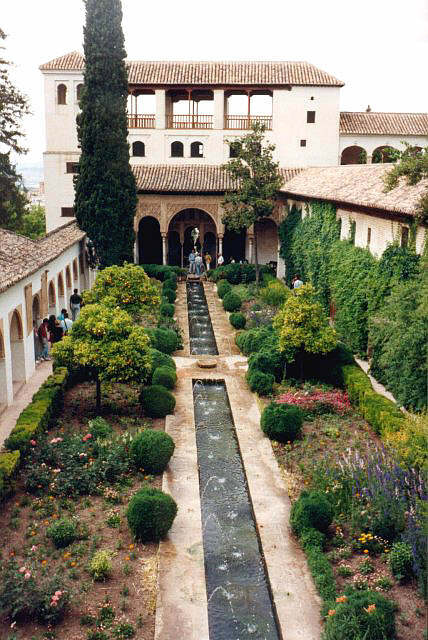 The gardens of the Alhambra show the influence of Persian Garden philosophy and style in a Moorish Palace scale, from the era of Al-Andalus in Spain (bottom). Persian influence increased at the Court of the Caliphs, and reached its zenith under al-Hadi, Harun al-Rashid, and al-Ma’mun. Most of the ministers of the last were Persians or of Iranian extraction. 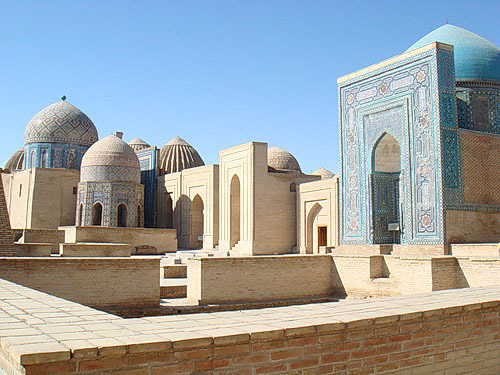 Afshīn Kheydār b. Kāvūs, the all-powerful favorite of the Caliph al-Mu’tasim and a scion of the Buddhist princes of Osrushana in modern-day Uzbekistan, was appointed Abbasid Supreme General and Governor of Sindh, Jebāl, Libya, Armenia and Azerbaijan. In Baghdad, Persian fashions continued to enjoy an increasing ascendancy, and the old Persian festivals of Nowruz and Mihrigan were celebrated. Persian raiment was the official court dress, and the tall black conical Persian hats (qalansuwa) were already prescribed as official by the second Abbasid caliph in 770 A.D. At the court, the customs of Sassanians were imitated and garments decorated with golden inscription were introduced which it was the exclusive privilege of the ruler to bestow. The Islamic Golden Age reached its peak during the 10th and 11th centuries, during which Persia was the main theater of academic activity, eclipsing al-Andalus (Muslim Spain) in volume and significance. Persian scholars and polymaths in various fields produced their masterpieces in Arabic—an Arabic whose lexicon they had made applicable to their respective fields in pioneer ways and for which they had popularized phrases, word forms, and grammatical structures through the dissemination of their works. 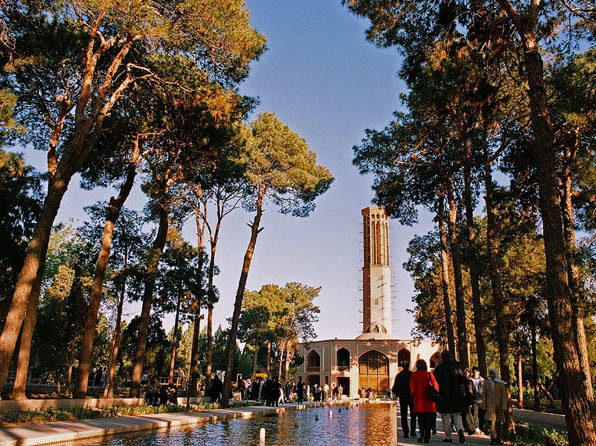 Among the most prominent of these individuals were al-Khwarizmi, Abu Sina (Avicenna), al-Tusi, al-Biruni, Omar Khayyam, al-Haitham, al-Shirazi, and Naser Khusraw. Ironically enough, we can imagine that a rather pure, eloquent spoken form of Classical Arabic was probably in use among Iranian scholarly circles in Khwārezm (a historic Iranian region roughly corresponding to modern day Uzbekistan and Turkmenistan), while the Arabic vernaculars spoken in major Arab-inhabited urban centers around the Islamic realm such as Baghdad, Damascus, and Cordoba were of colloquial provenance and were undergoing gradual deviation from Classical pronunciation, grammar and lexicon under the influence of regional linguistic factors. These colloquial transformations are reflected in contemporary literary productions such as 13th century manuscripts of “Arabian Nights” or “1001 Nights” (Arabic: Elf Leyla wa Leyla, based on an earlier Persian work Hazār Afsāna, literally “1000 Myths”) recovered from Syria and Egypt. The story of “1001 Nights”, also popularized under an orientalist misnomer “Arabian Nights”, is a series of adapted stories based on a mythical Persian king Shahryār and a storyteller Shahrzādeh. The core characters and structural framework of the Arabic language version are inextricably akin to an earlier Persian work, Hazār Afsāna, with the addition of a few Abbasid-era stories and Arabian motifs such as the Jinn. It is a remarkable fact that with few exceptions, most Muslim scholars…in the intellectual sciences have been non-Arabs. Thus the founders of grammar were Sibawayh and after him, al-Farisi and Az-Zajjaj. All of them were of Persian descent…they invented rules of (Arabic) grammar…great jurists were Persians… only the Persians engaged in the task of preserving knowledge and writing systematic scholarly works. Thus the truth of the statement of the Prophet becomes apparent, ‘If learning were suspended in the highest parts of heaven, the Persians would attain it…The intellectual sciences were also the preserve of the Persians, left alone by the Arabs, who did not cultivate them…as was the case with all crafts…This situation continued in the cities as long as the Persians and Persian countries, Iraq, Khorasan and Transoxiana (modern Central Asia), retained their sedentary culture. [Translated by F. Rosenthal (III, pp. 311-15, 271-4 [Arabic]; Frye, R.N. (1977). Golden Age of Persia, London: Weidenfeld & Nicolson, p.91)]. Mughal India, like the Ottoman Empire and the Timurid Empire, was a Persianate society (a society that is either based on, or strongly influenced by the Persian language, culture, literature, art, and/or identity.). Emperor Shāh Jahān (literally “King of the World” in Persian), commissioned a Persian architect from Badakshān named Ustād Ahmad Lāhauri to construct the Tāj Mahal (“Crown Place” in Persian) for his Persian wife and lover, Mumtāz Mahal (née Arjumand Banu Begum.) The Taj Mahal is one of the largest Persian Garden interpretations in the world. It was via this initially exclusive medium of scholarly and artistic expression promulgated by Muslim Iranian intelligentsia that Middle Persian began to assume a new form throughout the medieval Islamic period. Middle Persian words became archaic and even obsolete in favor of abstract Classical Arabic loanwords, a feature that was characteristic of the speech of the Muslim Persian city-dwelling elite. A modified Arabic orthography was applied to this transforming tongue in place of the Aramaic-based alphabet used to write Middle Persian. This new form of the Persian language became a prestige dialect and would later enjoy widespread patronage and even official currency in the royal courts of the Ottomans, the Timurids of Central Asia, and the Mughals in India. What are modern-day Turkey and the Indian subcontinent even became important centers of Persian literary and poetic production. In Persianate societies, Arabic words were indirectly transmitted via Persian influence into languages such as Urdu, Turkish, Uzbek, Azerbaijani, Kurdish, Turkmen, Pashto, Uyghur, as evidenced by the retention of Persian phonological modifications to Classical Arabic pronunciation in these languages. Sarti Uzbek (but not Khorezmian or Kipchak Uzbek) even lost vowel harmony—a rudimentary feature of Turkic phonology—as a result of Persian substratum and bilingualism. But this was by no means the first golden age for the Persian language—pre-Islamic Iranian languages likewise exerted a remarkably pervasive influence on neighboring tongues under the aegis of Iranian suzerains and civilized elite in those territories. Classical Armenian contained an impressive sixty percent of its general vocabulary derived from Iranian languages, and most Aramaic languages had been heavily Persified by the time of the Islamic conquest—even serving as media of transmission for Iranian borrowings into Arabic. Thus the prevalence of Arabic loanwords in Persian is largely the fruit of a medieval scholarly tendency among Iranian intelligentsia who were composing their works in Classical Arabic to then incorporate Arabic words and phrases into their speech, perhaps in an attempt to “enrich” the non-Islamic Middle Persian tongue and thereby delineate their stratum in society (city-dwelling, educated Muslim families) on the basis of their prestigious vernacular. Iranian scholars and polymaths also played a pivotal role in the standardization and diffusion of Classical Arabic, and Persians, Greeks and Syriacs served as cultural brokers in the Abbasid court. Hundreds of Iranian words and terms began to enter into Arabic language, sometimes via an Aramaic milieu, and were Arabicized (ta’rīb) in eccentric ways according to the phonetic and morphological system of that language. Verb derivatives were even formed from Iranian nouns according to the Arabic patterns (awzān). It follows that Iranian lexical borrowings in Classical Arabic (mu’arrabāt) pertained to all domains of civilized society, including botany, culinary matters, administration, architecture, minerals, philosophy, zoology, musical instruments, and items of luxury and power adopted from Sassanian Persia. The following are some notable and readily-recognizable Eastern Iranian/Parthian, Middle Persian (MP) loans, and Early New Persian (NP) that remain in Modern Standard Arabic (اللغة العربية الفصحى) as well as most dialects, although borrowings in Classical Arabic and Mesopotamian/Gulf dialects are far more widespread and numerous. The contacts between Arabia and the Sassanian Persian Empire were very close in the period immediately preceding Islam. The Arab Kingdom centered at al-Hira on the Euphrates had long been under Persian influence and was a headquarters for the diffusion of Iranian culture among the Arabs. 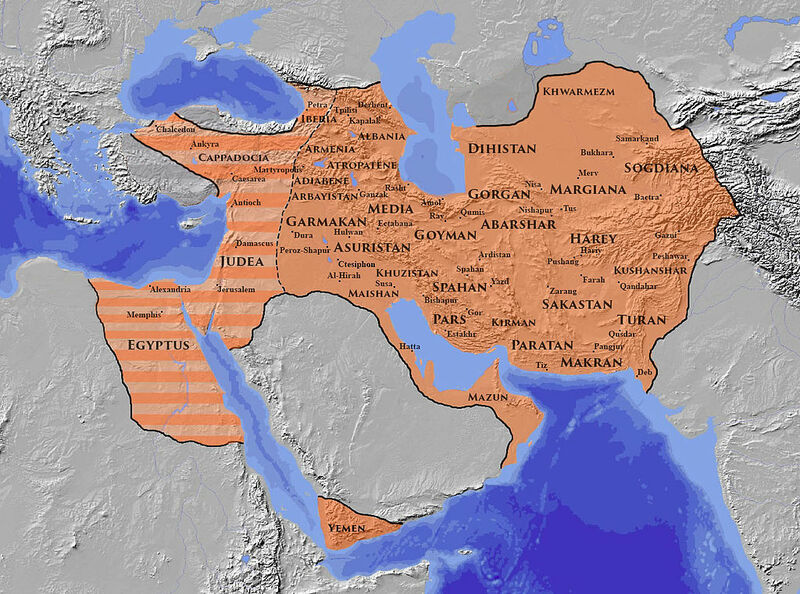 Throughout the titanic struggle between the Sassanids and the Byzantine Empire, where al-Hira had been set against the Kingdom of Ghassan, other Arab tribes became involved in the conflict and naturally came under the cultural influence of Persia. The Court of the Lakhmids at al-Hira was in pre-Islamic times a famous center of literary activity, and Christian poets such as Adi ibn Zaid lived long at this court and produced poems containing extensive Persian loanwords. But the Iranian influence was not merely felt along the Mesopotamian areas; it was an Iranian general and Iranian influence that overthrew the Abyssinian suzerainty in southern Arabia during Muhammad’s lifetime. 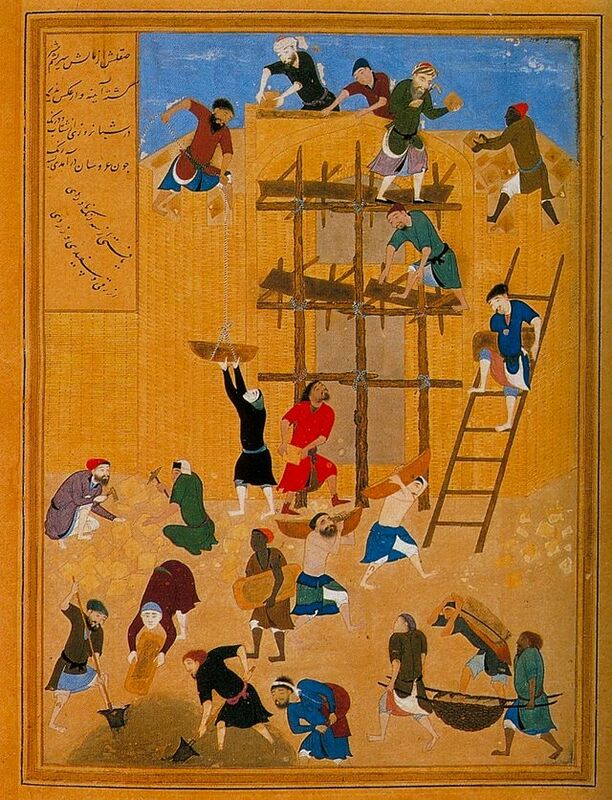 A Persian manuscript from the 15th century describing the construction of Al-Khornaq castle In Al-Hira, the Arab Lakhmids’ capital city. The Lakhmids were a Christian Arab tribe of Yemenite stock who established their center in southern Iraq in 266 A.D., near the Sassanid capital of Seleucia-Ctesiphon. In the early days of the Prophet’s mission, there were only seventeen men in the tribe of Quraysh who could read or write. It is said that an Iranian man, known as Hammad ar-Rawiya, seeing how little the Arabs cared for poetry and literature, urged them to study poems. In fact it was Hammad who selected the Mu’allaqāt, the seven Arabic poems written in pre-Mohammedan times and inscribed in gold on rolls of coptic cloth and hung up on the curtains covering the Ka’aba. In this period, Hammad knew more than any one else about the Arabic poetry. According to Edward Browne, before the advent of Islam, the Arabs had a negligible literature and scant poetry. It was the Iranians who after their conversion to Islam, feeling the need to learn the language of the Qur’an, began to use that language for other purposes. Ph. Gignoux hypothesizes that the Quranic phrase bismi’llahi’l-rahmani’l-rahim was modeled on the Middle Persian pad nam-i yazdan. Although there were antecedent Jewish and Christian parallels, a similar formula was also current among Zoroastrians and Manichaeans. In The Vocabulary of the Quran, Arthur Jeffrey enumerates over 40 words of Iranian origin in Qur’an, among them the following: ebriq, estabraq, barzakh, burhan, tanur, jizya, junah (from gonah), dirham, din, dinar, rezq, rauza, zabania, zarabi, zakat, zanjabil, zur, sejjil, seraj, soradaq, serbal, sard and zard, sondos, suq, salaba, ‘abqari, efrit, forat, firdaus, fil, kafur, kanz, maeda, al majus, marjan, mask, nuskha, harut and marut, wareda, wazir, yaqut. In addition, many terms in Classical Arabic literature are transliterations or calques of the Persian: Khamsa Mustaraqa from Panjeh-ye Dozdideh, Mushahira from Mahianeh, Nisf an-Nahar from Nim-ruz, an-Namal al-fares from Murcheh-Savari, Maleeh (origin of Levantine Arabic mniih “good, well”) from Namakin, Beyt an-Nar from Ateshkadeh, Balut al-Moluk from Shah-balut, Samm al-Himar from Khar-zahreh, Lisan al-thawr from Gav-zaban, Reyhan al-Mulk from Shah-Esperam. Eilers, Wilhelm. Iranisches Lehngut im arabischen Lexikon: Über einige Berufsnamen und Titel. Gravenhage: Mouton, 1962. Lane, Edward William. An Arabic-English Lexicon. Hovannisian, RIchard G.; Sabagh, Georges. The Persian Presence in the Islamic World. Cambridge University Press, 1988. Tafazzoli, A. Arabic Language ii. Iranian loanwords in Arabic. Browne, Edward. A Literary History of Persia, Vol. I.
MacKenzie, D.N. A Concise Pahlavi Dictionary. Psychology Press, 1971. Shir, Addi. Al-Alfâz Al-Fârsîyya Al-Mu`arraba (A Dictionary of Persian Words in the Arabic Language). Library of Lebanon, 1980. Gharib, B. Sogdian Language i. Loanwords in Persian. Agius, Dionisius A. Classic Ships of Islam: From Mesopotamia to the Indian Ocean. Brill Academic Pub, 2007. Cheung, Johnny. Etymological Dictionary of the Iranian Verb. Brill Academic Pub, 2007. تاثیر زبان فارسی بر زبان و ادبیات شبه قاره هند. محمد عجم.